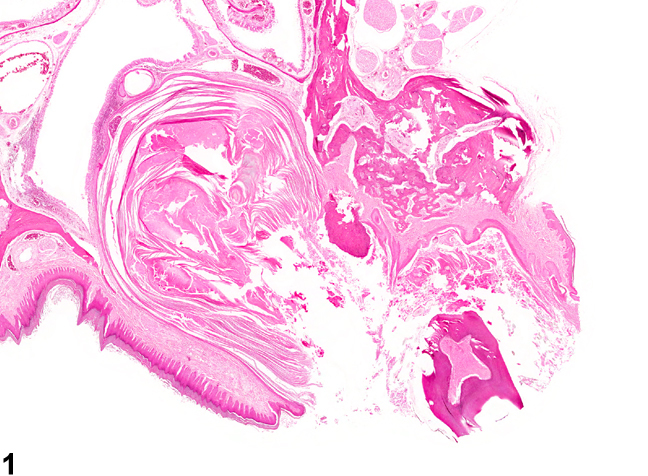 Oral mucosa - Hyperplasia, Cystic, Keratinizing in a male Harlan Sprague-Dawley rat from a chronic study. The keratin-filled cyst is distorting normal architecture, including that of the nasal cavity. Oral mucosa - Hyperplasia, Cystic, Keratinizing in a male Harlan Sprague-Dawley rat from a chronic study (higher magnification of Figure 1). 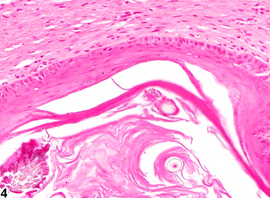 The keratin-filled cyst with destruction of maxillary bone is shown. 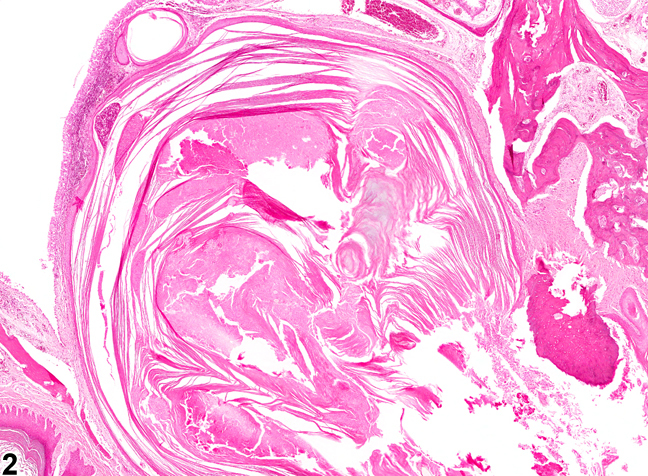 Oral mucosa - Hyperplasia, Cystic, Keratinizing in a male Harlan Sprague-Dawley rat from a chronic study (higher magnification of Figure 1). The wall of the cyst is fairly uniform. 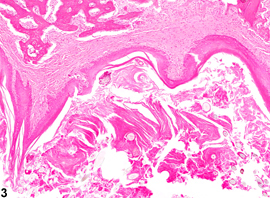 Oral mucosa - Hyperplasia, Cystic, Keratinizing in a male Harlan Sprague-Dawley rat from a chronic study (higher magnification of Figure 1). The epithelial cells in the wall of the cyst are normal. Cystic keratinizing hyperplasia is characterized by areas in the gingiva in which the epithelium is markedly hyperplastic and raised in papillary folds forming cyst-like spaces filled with keratin in the gingival and adjacent tissues. Some of these lesions occur in isolation, whereas others occur in association with diffuse hyperplastic lesions of the mucosa. The number of cavities can vary from one to multiple, giving the lesion a multilocular appearance. Generally, a connection can be seen between the cystic structure and the overlying gingival oral mucosa, suggesting the cystic keratinizing hyperplasia may have arisen from squamous hyperplasia. A differential diagnosis for this lesion is a squamous cyst (see Oral Mucosa – Cyst, Squamous) and periodontal pocket (see Tooth – Periodontal Pocket). Squamous cysts and periodontal pockets tend to be unilocular structures lined by a fairly thin, benign-appearing squamous epithelium and do not appear to be arising from a hyperplastic gingival mucosa. Squamous cysts may have hair follicles in the squamous epithelium lining the cyst. Periodontal pockets are common background alterations in rodents restricted to the periodontal tissues surrounding the teeth, especially molars. The pockets represent an abnormally deepened gingival sulcus that is lined by keratinized squamous epithelium, and the lumen may contain hair, feed, bedding material, and keratin. Cystic keratinizing hyperplasia must also be differentiated from early squamous cell carcinoma, in which the cells are pleomorphic or atypical and there is disorderly maturation of the squamous cells. Cystic keratinizing hyperplasia may be on a continuum with hyperplasia and squamous cell carcinoma as this lesion was seen in a study in which there was also a significant increase in gingival squamous cell carcinomas. Whenever present, cystic keratinizing hyperplasia should be diagnosed and graded based on the number and size of cyst-like areas filled with keratin. Secondary lesions, such as inflammation or bone remodeling, should not be diagnosed separately unless they are a significant component of the lesion. National Toxicology Program. 2010. NTP TR-558. Toxicology and Carcinogenesis Studies of 3,3’,4,4’-Tetrachloroazobenzene (TCAB) (CAS No. 14047-09-7) in Harlan Sprague Dawley Rats and B6C3F1 Mice (Gavage Studies). NTP, Research Triangle Park, NC. Ramot Y, Vered M, Malarkey DE, Hooth MJ, Painter JT, Dayan D, Clayton N, Masinde T, Nyska A. 2012. Immunohistochemical features of 3,3’,4,4’-tetrachloroazobenzene-induced rat gingival lesions. Toxicol Pathol 40:577-592.